The site of the old medieval quarter of the city of Bergen, Bryggen is a charming, compact area of brightly coloured wooden homes that traditionally housed the city's merchants. Also called Tyskebryggen, its steep cobbled lanes are lined with a vivacious blend of cafes and artisans' workshops. With many buildings dating from before the 17th century, The Hanseatic wharf area has been declared a UNESCO World Heritage Site and is considered to be one of the most important examples of a medieval settlement in the world. Bryggen was once the working area of the merchants and is the oldest part of Bergen, characterised by a maze of lopsided wooden buildings with pointed gables facing the harbour. 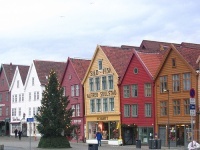 The Bryggen and Hanseatic Museums, as well as the 12th-century St Mary's Church, are all in the Bryggen area. At one end of the wharf is Bergen's famous fish market, a colourful market also selling flowers, fruit, vegetables, and souvenirs. Because of its predominantly wooden buildings, Bryggen has struggled with fire throughout its long history and many of the structures have been rebuilt several times. One of the unexpected advantages of the destruction caused by fire was the discovery of a wealth of runic inscriptions, now housed in the Bryggen Museum.